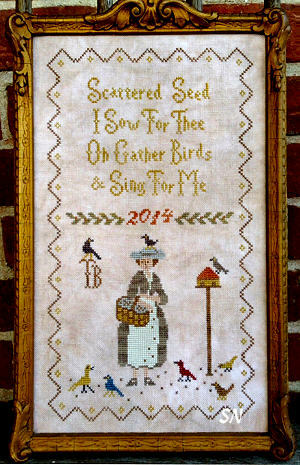 Scattered Seed Samplers has a new design that offers a neat finishing idea for some of the other charts-in-waiting in your stash! 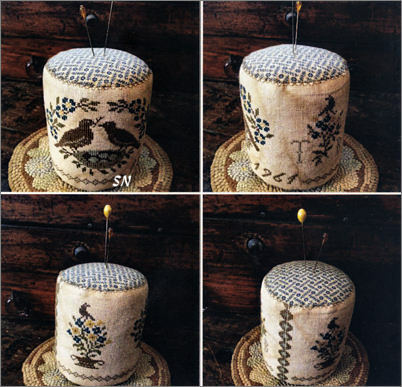 Designed to be a pin cushion to hang over the arm of your stitching chair, *Busy hands, happy heart* decorates one side, and *Hand and heart will never part* decorates the other. 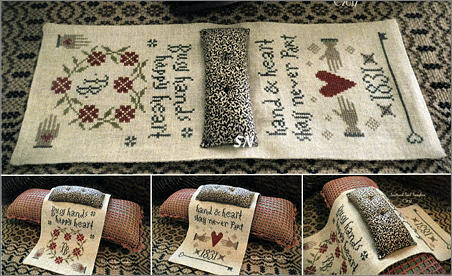 A cute design by Scattered Seed Samplers, this is stitched with only one shade of floss, in this case -- 924 DMC teal. Choose one color of any hand-dyed you like, and stitch away! 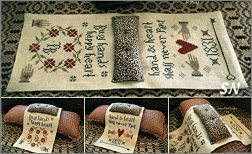 Stitch count is 114 x 73, so finished size depends on whatever fabric you choose as well. The designer has finished this into a scissor mat -- kind of a neat idea that is useful and a neat way to enjoy something you've stitched and finished! Presented as a chart. 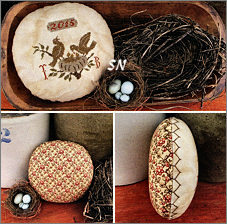 A Sweet set of three 'panels' surround this 4-1/2 inch high drum that is 3-1/2 inches in finished diameter. Just 9 shades of regular DMC floss, there are instructions in here for tea staining as well as the drum assembly process. Simple bluebirds and two different urn designs, a very pretty presentation on a shelf in front of a sampler. 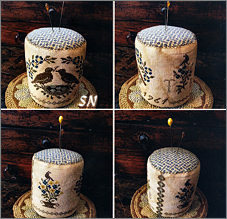 More sweet birds on a pin cushion top, I actually like the finishing on this at least as much as the stitching! What a pretty edging treatment, so you don't need trim! Stitching measures just 4 x 4... using this edge treatment... you could even make this as a 'mattress bottom' to a special basket. (You know -- the one you are slowly filling with all your stitched pin cushions which are fashionable to call *Bowl Fillers! *) Coded for just 6 colors of DMC. 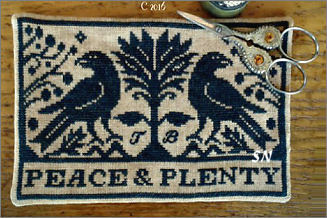 Oh, I love the name of this piece by Scattered Seed Samplers! 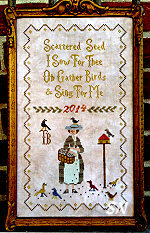 *Scattered Seeds I Sow for Thee, Oh Gather Birds to Sing For Me. * An original verse by Tammy Black for her 7 x 12-ish inch sampler, this is worked on 32ct with Weeks and Gentle Art flosses. A pretty piece, it needs to be stitched for the bird-lover in your life -- especially the ones who don't mind the weeds that grow from all those uneaten scattered seeds!!!!! Offered as a chart.